KUK Date Sheet 2019 – Kurukshetra University has released the KUK Date Sheet pdf for theory and practical exam. The University releases the date sheet for annual and semester exam online at www.kuk.ac.in. Students can check this page for KUK Date Sheet and KUK DDE Date Sheet. The examination name, date, time, exam centre, notes, subject, and paper name. It is mandatory to submit the exam form and fees to appear in the university exam. Kurukshetra University releases the admit card for all the students who are eligible to write the exam. It is also important to carry the admit card on the day of the exam. Check the page for KUK Date Sheet 2019. Latest: Kurukshetra University has released the theory and practical date sheet for semester exam April/May 2019. The KUK University exam date sheet has been issued separately for the theory and the practical paper. The candidates should also note that it is distinct for the regular and the distance courses. As and when the KUK Exam Time Table will keep on releasing, we will update it on this page. Datasheet: KUK Date Sheet 2019 is available at www.kuk.ac.in. UG Courses: B.A, B.Sc, B.Pharm, LL.B., BA. LL.B., BCA, BIM, BTM, BIHBM, BHM and CT, BBA, B.Ed., B.Ed. Special Education, C.P.Ed., B.Lib. and Inf. Sc., Shiksha Shastri, etc. PG Courses: M.A, M.Tech, D.Ed., M.Lib. and Inf. Sc., LL.M., M.Phil., M.Ed., M.Ed. (Special Education), M.P.Ed., MIB, MMT, MFC., MBA Hospitality Management, MBA, MCA, MBA (Hons. ), MBA (Service Management), MBA 5 Year, MTM, M.A. (Social Work), M.Sc., Master of Fine Arts, PGDCA, BAMS, MBBS, Diploma courses, etc. Distance Courses: B.A, B.Com, M.A., M.Sc., C.C.A, B.C.A., P.G. D.C.A, M.Sc. C.S. (Sw), M.C.A. (3 years), P.G. D.E.M.M., M.B.A, M.B.A. (H.M.), D. Lib.Sc., B. Lib.Sc, M. Lib.Sc., P.G.D.J.M.C., M.A M.C., B.Ed., M. A. Edu., LL.M., P.G. D.E.E., M.A. E.E., C.C.U, P.G.D.T.(H/E). Established in 1957, Kurukshetra University has secured a place among the top universities in India. It is abbreviated as KUK. 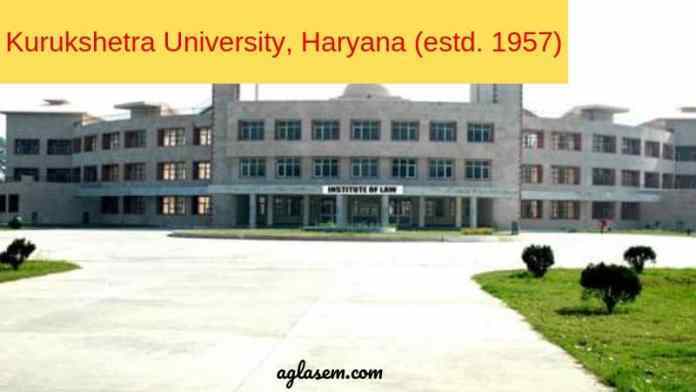 The University is spread across 400 acres, in Haryana, providing a suitable study place to aspirants all over the nation. Initially, the University started only with the Department of Sanskrit. However, over a period of time, the University started offering more than 40 UG and PG courses. The University holds a total of 457 affiliations with the colleges and institutes. The most notable of these are with E-max School of Engineering and Applied Research, Sri Krishan Institute of Engineering and Technology, Government Engineering and Technology, Nilokheri, and Jind Institute of Engineering and Technology.